From the Center for Healthful Behavior Change, Division of Health & Behavior, Department of Population Health, New York University, New York, NY (AS, DMR, MB); Cornell University, Ithaca (LJ). Background: While increasing evidence supports the beneficial effects of shared decision making (SDM) on patient outcomes, the mechanisms underlying this relationship is unclear. This study evaluated length of the patient-provider relationship as one potential factor that may explain how SDM affects medication adherence in patients with hypertension. Methods: An observational study of 75 hypertensive patients and 27 providers in 3 primary care practices in New York City. A single-item measure assessed patients' preferences for decision-making style at baseline; medication adherence was collected over the 3-month study with an electronic monitoring device. Length of the relationship was measured as the number of years with the provider, and dichotomized as less than or greater than 1 year with the provider. Two generalized linear mixed models were conducted to determine whether the SDM-adherence association was modified by length of the relationship. Results: Most patients were Black and women, and 64% were seeing the same provider >1 year. Providers were mostly White women and have been at the clinic for 6 years. In the main-effects model, patients were more likely to exhibit better adherence when they preferred shared and active decision-making styles as compared with those who preferred a passive style (B = 15.87 [Standard Error [SE]: 6.62], P = .02; and B = 22.58 [SE:7.62], P = .004, respectively). In Model 2, the relative importance of SDM on adherence decreased as years with the provider increased (t(48) = 2.13; P = .04). Conclusion: The benefits of SDM over passive decision making on medication adherence were reduced with increasing years of the patient-provider relationship. Having an established relationship with the provider may have a positive impact on medication adherence that is comparable to relationships high in SDM. While a growing body of research supports the positive attributes of engaging in SDM on both patient- and relationship-level outcomes, the mechanisms through which SDM may exert its effects remains unclear. A thematic analysis of the extant literature suggests that attributes of the patient-provider relationship and the health care system within which the relationship occurs can either enable or impede patients' ability to engage in SDM.12,13 Good continuity of care is one aspect of the health care system that can engender positive patient-provider relationships (eg, by increasing affiliation) and in turn, facilitate patient's participation in SDM.14 Continuous care is particularly important for patients with chronic diseases such as hypertension who require ongoing management with an established provider to have consistent communication about the disease and its treatment, support patient adherence to their medications, and ensure coordination of care across providers.15⇓–17 In this article, we examine longitudinal continuity (ie, number of years with the provider) as one potential component of continuous care that may explain how SDM affects health outcomes such as medication adherence in hypertensive patients. Our study aims were 2-fold: 1) to evaluate the direct effect of SDM on objectively measured medication adherence among a sample of primary care providers (PCPs) and their hypertensive patients, and 2) to examine whether number of years with the provider modified the SDM-adherence association. We hypothesized that preference for SDM would be associated with better medication adherence as compared with preferences for passive and active decision making, and that this association would be stronger as years with the provider increased. Participants were previously recruited in an observational study, which evaluated the patient, provider, and clinic-level factors that impact medication adherence among hypertensive patients from 3 primary care practices, which serve a multi-ethnic, low-income population in New York City, NY.18 Patient eligibility included 1) self-identification as Black/African American or White/white, 2) diagnosis of hypertension (ICD: 401 to 401.9), 3) taking at least 1 antihypertensive medication, 4) aged ≥18 years, and 5) having attended at least 1 prior visit with the participating PCP. PCPs were defined as attending providers (MD/DO) or nurse practitioners who provided care at the practices to the study patients. All participants provided informed consent approved by New York University's Institutional Review Board. Data were collected at baseline and 3 months following the baseline patient-provider visit. Trained research assistants collected data on patients' preferences for decision making before the baseline clinic visit. After the visit, research assistants provided each patient with an electronic monitoring device (EMD) to measure his/her medication-taking behavior for the duration of the 3-month study. EMDs are standard pill bottles with an electronic cap that records the date and time the bottle is opened. If patients were prescribed multiple antihypertensive medications, PCPs were asked to choose 1 medication taken once daily to be placed in the bottle. Patients received a telephone call the day after the baseline visit to ensure they placed the correct medication in the bottle. Medication adherence was assessed with an EMD as noted above. To control for “pocket dosing” (eg, use of pill boxes, removing doses for travel), patients were also asked to keep diaries during the 3-month study period, which were accounted for in the analyses.20 Medication adherence was calculated using the scheduling adherence metric, using the formula, ([the number of pills taken/the prescribed dose per day] × 100%)/the time interval of study period (90 days).21 Adherence rates ranged from 0% to 100%. Length of the patient-provider relationship was collected at the baseline visit using the longitudinal continuity item on the Primary Care Assessment Survey.22 Responses included the following time intervals: less than 6 months, between 6 months and 1 year, 1 to 2 years, 3 to 5 years, and more than 5 years. Responses were dichotomized into 2 categories based on the median value of the scale (median, 4.5; range, 1 to 7): less than 1 year with the provider and 1 year and greater. Sociodemographic Data. Patient-level data included age, gender, race, marital status, employment status, education and income level, and insurance status. Provider-level data included age, gender, race, place of birth, duration of practice at the site, type of provider (ie, MD/DO, nurse practitioner) and specialty. Data on medical comorbidity,23 prescribed antihypertensive medications, and blood pressure were extracted from patients' electronic medical records at the baseline and 3-month study visits. Descriptive statistics were generated for the patient, PCP, and visit characteristics in addition to frequencies of decision making preferences. We compared adherence rates by decision-making preference using the χ2 statistic. Patient- and provider-level variables were included in the multivariate models if they were associated with decision making preference or medication adherence at P < .10 in bivariate analyses. Analyses were conducted using generalized linear mixed models. Providers were modeled as the random effect to adjust for potential nesting caused by multiple patients seeing the same provider. All independent variables were modeled as fixed effects. Two generalized linear mixed models were conducted to determine whether the association between decision-making preference and medication adherence was modified by length of the patient-provider relationship. In Model 1, independent associations between the independent variable (decision-making preference) and dependent variable (adherence) were assessed, while adjusting for selected patient- and PCP-level covariates (eg, patient's age and race; provider's gender). In Model 2, the product between length of the relationship and decision making preference was added to Model 1. Specifically, point estimates for medication adherence were estimated using the fully adjusted linear regression of Model 2. These estimates were calculated by dividing the sample by decision making style and by individuals who were with their provider for <1 year and those who were with their provider for ≥1 year. These estimates were then plotted and 95% CI were generated. SPSS version 23 (IBM Corp., Armonk NY) was used for all analyses and significance levels were set at P ≤ .05. A total of 104 patients were recruited into this study: 75 (83%) had usable EMD data. There were no significant differences between patients with and without usable EMD data for all demographic and decision-making variables. Of the 28 PCPs invited to participate, only 1 declined. Therefore, our study analytic sample was comprised of 75 patients and 27 PCPs. Patient and PCP characteristics are shown in Tables 1 and 2, respectively. Approximately half of patients were female (56.0%), one third had Medicaid (33.3%), and half reported some college education (56.0%), with a mean age of 60 (SD, 10.3) years. Almost two thirds of patients (62.7%) had been seeing the same PCP for at least 1 year. Most PCPs were MDs (96.3%), internists (94.3%), and female (66.7%) with a mean age of 36.2 years. Almost two thirds of patients (57.3%) preferred to engage in SDM in the clinic visit (Table 3). Alternatively, one quarter (24.0%) of patients preferred active decision making, in which patients make the final decisions, after possibly considering the provider's opinion. 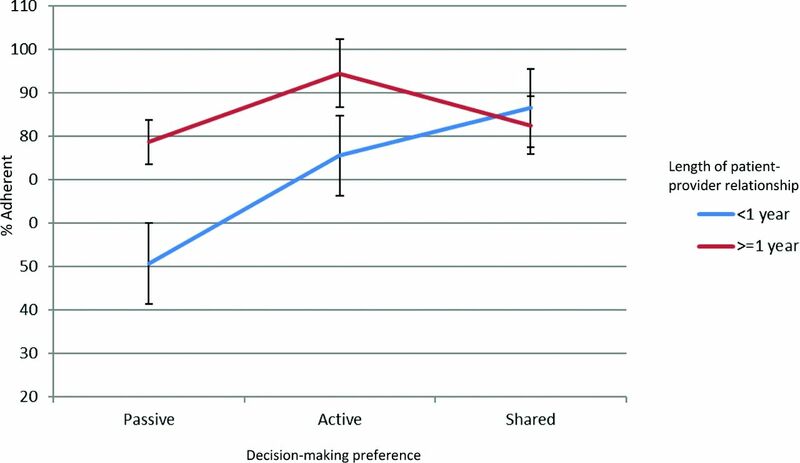 Few patients preferred passive decision making (18.7%) suggesting that fewer individuals want to leave decision making solely up to their provider. The mean adherence rate for the total sample was 81.3% (SD, 23.1). Patients who preferred an active decision-making style (N = 18) had a mean adherence of 89.3% (SD, 17.7; Table 3). The mean adherence for patients who preferred SDM (N = 43) was 83.8% (SD, 19.5). Patients who preferred a passive style (N = 14) exhibited the lowest adherent rate of 63.0% (SD, = 30.2). After adjusting for patient (age, race, insurance status, number of medications) and provider characteristics (gender, age), there was a significant main effect of decision-making style on adherence in Model 1, such that preferences for shared and active decision-making styles were associated with better medication adherence as compared with preference for a passive style (B = 15.87 [Standard Error [SE]:6.62], P = .02; and B = 22.58 [7.62], P = .004, respectively; Table 4). In Model 2, the product of decision-making preference and relationship length was added to Model 1. As shown in Table 4, there was a significant effect modification of the association between preference for SDM and medication adherence by relationship length (B = −28.74 [12.50]; P = .025). The negative relationship indicates that the relative importance of SDM on adherence decreases as the length of the relationship with the provider increases. Length of the patient-provider relationship also had a direct effect on adherence (B = 27.53 [SE:10.93]; P = .01). Post-hoc analysis of the interaction effect indicates that the difference in estimated adherence for the passive decision making group in comparison to the SDM group is significantly different from zero (t(48) = 2.13; P = .038). That is, adherence rates among patients who prefer a passive decision-making style increases to a level similar to those patients who prefer SDM as the length of the relationship increases. The test of this difference is nonsignificant in the shared and active decision-making groups indicating that length of the relationship has no effect on adherence among these patients (t(52) = 1.46; P = .15). Figure 1 displays the results of Model 2. Effect modification of length of patient-provider relationship on decision-making preference and medication adherence. We should note the following limitations: Our study was comprised of predominately low-income Black and White hypertensive patients receiving care in safety-net clinics thus; the findings may not generalize to higher income patients or other racial/ethnic groups. Due to cost constraints, this study only allowed the patient's primary antihypertensive medication to be monitored by the EMD. While this does not reflect adherence rates to other medications, there is evidence that the pattern of adherence to one antihypertensive medication often reflects adherence to others.34 We also examined self-reported preferences for decision making style and not what actually happened during the encounter. In addition, preferences were measured at baseline in the context of one discussion. Funding: This study was supported by a grant from the National Heart, Lung, and Blood Institute (NHLBI) HLK23HL098564. Disclaimer: The contents of this article are solely the responsibility of the authors and do not necessarily represent the official views of the National Heart, Lung, and Blood Institute. The funding agency did not play a role in the study design; collection, analysis, and interpretation of data; the preparation of the article; or the decision to submit the article for publication. To see this article online, please go to: http://jabfm.org/content/31/5/752.full. Received for publication January 8, 2018.
. Shared decision making–pinnacle of patient-centered care. N Engl J Med 2012;366:780–1.
. Shared decision-making in primary care: The neglected second half of the consultation. Br J Gen Pract 1999;49:477–82.
. Shared decision making and the concept of equipoise: The competences of involving patients in healthcare choices. Br J Gen Pract 2000;50:892–9.
. Shared decision making: A model for clinical practice. J Gen Intern Med 2012;27:1361–7.
. Patient preferences for shared decisions: A systematic review. Patient Educ Couns 2012;86:9–18.
. Assessing the effects of physician-patient interactions on the outcomes of chronic disease. Med Care 1989;27(3 Suppl):S110–S127.
. Effective physician-patient communication and health outcomes: A review. CMAJ 1995;152:1423–33.
. The impact of patient-centered care on outcomes. J Fam Pract 2000;49:796–804.
. Do increases in patient activation result in improved self-management behaviors? Health Serv Res 2007;42:1443–63.
. A user's manual for the IOM's ‘Quality Chasm’ report. Health Aff (Millwood) 2002;21:80–90.
. Where is the evidence? A systematic review of shared decision making and patient outcomes. Med Decis Making 2015;35:114–31.
. Knowledge is not power for patients: A systematic review and thematic synthesis of patient-reported barriers and facilitators to shared decision making. Patient Educ Couns 2014;94:291–309.
. Dimensions of patient-provider communication and diabetes self-care in an ethnically diverse population. J Gen Intern Med 2003;18:624–33.
. Continuity of care: An essential element of modern general practice? Fam Pract 2003;20:623–7.
. Continuity of care, self-management behaviors, and glucose control in patients with type 2 diabetes. Med Care 2002;40:137–44.
. Continuity of care: Influence of general practitioners' knowledge about their patients on use of resources in consultations. BMJ 1991;303:1181–4.
. Addressing the social needs of hypertensive patients: The role of patient-provider communication as a predictor of medication adherence. Circ Cardiovasc Qual Outcomes 2017;10(9).
. The Control Preferences Scale. Can J Nurs Res 1997;29:21–43.
. Patients' perceptions of electronic monitoring devices affect medication adherence in hypertensive African Americans. Ann Pharmacother 2008;42:647–52.
. Measurement of adherence in pharmacy administrative databases: A proposal for standard definitions and preferred measures. Ann Pharmacother 2006;40(7–8):1280–8.
. The Primary Care Assessment Survey: Tests of data quality and measurement performance. Med Care 1998;36:728–39.
. Patient and physician factors associated with adherence to diabetes medications. Diabetes Educ 2012;38:397–408.
. Behavioural factors associated with symptom outcomes in a primary care-based depression prevention intervention trial. Psychol Med 2003;33:1061–70.
. Patient-physician racial/ethnic concordance and blood pressure control: The role of trust and medication adherence. Ethn Health 2014;19:565–78.
. Trust, medication adherence, and hypertension control in Southern African American men. Am J Public Health 2012;102:2242–5.
. Sharing as the future of medicine. JAMA Intern Med 2017;177:1237–8.
. What perceptions do patients have of decision making (DM)? Toward an integrative patient-centered care model. A qualitative study using focus-group interviews. Patient Educ Couns 2012;87:206–11.
. A shared treatment decision-making approach between patients with chronic conditions and their clinicians: The case of diabetes. Health Expect 2006;9:25–36.
. Older people's preferences for involvement in their own care: A qualitative study in primary health care in 11 European countries. Patient Educ Couns 2007;68:33–42.
. shared understanding with patients. JAMA Intern Med 2017;177:1247–8.
. Systematic review of the effects of shared decision-making on patient satisfaction, treatment adherence and health status. Psychother Psychosom 2008;77:219–26.
. The effect of prescribed daily dose frequency on patient medication compliance. Arch Intern Med 1990;150:1881–4.
. How does communication heal? Pathways linking clinician-patient communication to health outcomes. Patient Educ Couns 2009;74:295–301.
. Variability in patient preferences for participating in medical decision making: Implication for the use of decision support tools. Qual Health Care 2001;10(Suppl 1):i34–i38.
. Interpersonal continuity of care and type two diabetes. Prim Care Diabetes 2016;10:165–70.
. The effect of primary care provider turnover on patient experience of care and ambulatory quality of care. JAMA Intern Med 2015;175:1157–62.
. Relation between family physician retention and avoidable hospital admission in Newfoundland and Labrador: A population-based cross-sectional study. CMAJ Open 2017;5(4):E746–E752.
. Information and shared decision-making are top patients' priorities. BMC Health Serv Res 2006;6:21.
. Does improved continuity of primary care affect clinician-patient communication in VA? J Gen Intern Med 2014;29(Suppl 2):S682–688.
. Sharing experiences of illness and care. JAMA Intern Med 2017;177:1249–50.
. Are mobile health applications useful for supporting shared decision making in diagnostic and treatment decisions? Glob Health Action 2017;10(sup3):1332259.
. Usability of a novel mobile health iPad app by vulnerable populations. JMIR Mhealth Uhealth 2017;5(4):e43. Maskrey, Gordon, A. Sharing Understanding with Patients. JAMA Intern Med. 2017;177:1247–1248.
. Prime time for shared decision making. JAMA 2017;317:1309–10.